A Pink Pearlised Liquid Hand Soap in a 5 litre container. Can also be used as shampoo and body wash.
For use in both commercial and industrial enviroments. Bulk pack toilet tissue dispenser, for use with PD119 toilet tissue. Modular Centrefeed paper roll towel dispenser. 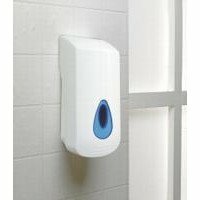 Modular White Plastic Hand Towel Dispenser. Modular White Plastic Bulk Fill Soap Dispenser. Modular White Plastic Jumbo Toilet Roll Dispenser with blue transparent viewing panel in the front of the dispenser. 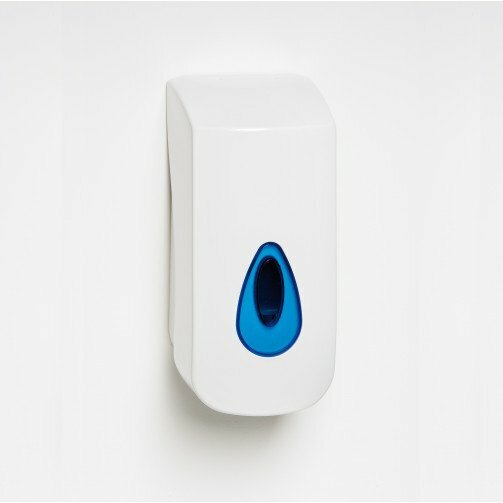 Modular White Plastic Mini Jumbo Toilet Roll Dispenser, with blue tear viewing window on the front of the dispenser. A white plastic Modular Twin Roll Dispenser which uses standard toilet rolls. Modular White Plastic Mini Paper Towel Dispenser. Modular White Plastic Midi Jumbo Toilet Roll Dispenser, with blue tear viewing window on the front of the dispenser. COES105 – 400ml Soap Dispenser. The Modular Range of soap dispenser’s specificity allows any type of chemicals to be dispensed from a 400ml refillable container or a disposable pouch, allowing greater flexibility in terms of chemical selection. This Dispenser is made from hard wearing ABS plastic which automatically locks when closed, and is supplied with a locking key. The Modular dispenser comes as standard with a blue window for easy level checks, however we now have the different coloured windows available to purchase. A Multi Purpose soap dispenser for high usage areas. Dispenses a wide range of hygiene products from viscous liquids to thick gels and barrier creams with a 2 litre refillable reservoir. Soap level gauge, large, easy to use push action, lockable cover, strong ABS plastic construction, easy to maintain. Spare keys are available at £4.99 + vat please contact the sales team on 01299 252440.